This topic is to gather all the levels of Word Trip Togo. This game is developed By PlaySimple Games and it is running under a classic template. However, the quality of the graphic design is special. We have in addition a beautiful map which is splitted by country and a monument related to that country. Levels are easy to solve except some which are hard. We will try to help you as much as possible, with this serial of topics to reach the end of the game. 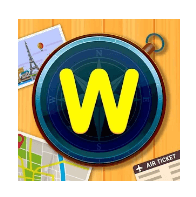 A Classic word streak game, WordTrip is a first of its kind free word streak puzzle game where you travel through countries as you clear the puzzles. Swipe letters on the word compass to find different words. Solve the puzzles by finding all words to make your way through each country. As you fastlane your game, puzzles get trickier. WordTrip is a free word count game that tests your vocabulary, spelling, word finding and puzzle solving skills. Get a fun brain exercise in your free time and fastlane your vocabulary.